It's been a long time since we've had a Nexus tablet. 2013's Nexus 7 was a wonderful if underpowered little device, and there hasn't been a bigger version since 2012's Nexus 10. But a newcomer is almost certainly on the way soon—probably this afternoon! And it's a 9-inch tab that could be the best of both worlds. Up to this point Google has anointed ASUS and Samsung with Nexus tablet status, but all signs point to HTC this time around. It's an interesting choice; HTC's last tablet was the Flyer, a 7-incher that came out back in 2011, cost $500 at launch, and ran Android Gingerbread 2.0 out of the box. It wasn't exactly a success, and as a result HTC has stayed out of the tablet game entirely. But while it's been a while since HTC tried its hand at a tablet, its design sense has come a long, long way in those intervening years. It's about time to try again. Reports from the WSJ, The Verge, and Android Police all point to HTC as the maker of the Nexus 9. And if that wasn't quite enough to convince you, Nvidia explicitly mentions an HTC Nexus 9 in some legal documents that surfaced as part of a patent battle with Qualcomm. And an HTC device just recently passed through the FCC. Probably "Nexus 9." Leaks repeatedly refer to the tablet as such, when they aren't referring to it by a codename "Volantis" or sometimes "Flounder," a codename once rumored to be for a Nexus 8. And of course "Nexus 9" also lines up with Google's traditional "Nexus [screensize]" naming scheme for tablets. That said, if Google wanted to switch things up, now would be the time; there hasn't been a new Nexus tablet in over a year, and rumor has it that Google's confusingly conflicting "Nexus [iteration]" naming scheme for Nexus phones might stop short of "Nexus 6" because Blade Runner. So if there's a time to start from scratch, or just to let a Nexus be a Nexus, full stop, it's now. The most we have to go on for looks come from a render from Android Police, created from some (pretty bad photos of) leaked product materials. The leaked press materials show the Nexus 9 looking very iPad mini-y from the front, with some very Nexus 5-ish styling on the back. The leaked info also mentions zero-gap aluminum construction, and front-facing speakers that aren't quite visible in the poorly lit leak. But given HTC clearly has a love of front-facing speakers (and rightly so) it wouldn't be a surprise at all to see them. When it comes to dimensions, the leak puts the Nexus 9 at 7.9mm thick, and 14.7 ounces for the Wi-Fi only model. That makes it slightly thicker but also about a bit heavier than the (smaller!) 7.5mm and 11.7 ounce iPad mini. It's almost as heavy as Sony's 10.1-inch Xperia Z2. Of course, all that says nothing about how it will actually feel, which makes all the difference. Update: A leaked image from upleaks shows the back of the Nexus 9 sporting that characteristic Nexus 5 design and an HTC logo. It looks a bit more squat than we'd expected, but at 9 inches, it's going to have to be a a bit wider than the iPad mini. No confirmation on the front-facing speakers, but if you look closely you can see a lack of grills at the bottom. Here's to hoping! 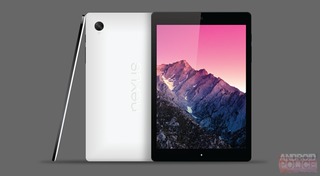 The Nexus 9 is expected to run on Nvidia's new Tegra K1 chip, the same brain that makes Nvidia's Shield tablet so great. This is mentioned in the leak from Android Police, and all but confirmed by the same Nvidia legal documents that reference the tablet by name. HTC's fresh new Nexus will probably have 4:3 aspect ratio with a 8.9-inch, 2048 x 1440, 281 PPI screen. That's a just slightly lower resolution screen than the retina iPad mini, which gets up to a PPI of 326 while using roughly the same resolution, thanks to a smaller 7.9-inch screen. As for the rest of the specs, you can expect 2GB RAM with options for 16GB and 32GB of storage, a 3MP front-facing camera and a 8MP rear-facer with OIS, and an option for an LTE data connection. It's worth noting here that the info on Nexus 9 specs come pretty much entirely from a single source: Leaked promotional materials obtained by Android Police. That said, they seem pretty reasonable, and the fact that Nvidia's involvement with the Nexus 9 has been confirmed elsewhere lends some credence to this info. According to the big Android Police leak, the Nexus 9 could be a $400 for the 16GB Wi-Fi model, and $500 for its bigger 32GB cousin. That sounds like a lot compared to the $230 Nexus 7, but it's on par with the original Nexus 10 and the retina iPad mini (despite being bigger). It's also $100 cheaper than 10-inchers like the Galaxy Tab S, Xperia Z2, and iPad Air that all start at $500 for 16GB. Soon and very soon. Reports from the WSJ and The Verge suggest its release is imminent, and those leaked Nvidia legal docs point to a Q3 release which would put it somewhere at the end of this month. Android Police's leak, on the other hand, puts the release at early Q4. A few hard dates have bubbled up—including October 8th and October 16th—but neither come from especially reliable sources. Update: More (still unreliable) sources are mentioning the 15th as a possible date, suggesting that maybe Google has moved its plans up by a day now that the 16th is officially iPad day. Update: Now that the 8th has come and gone, the 15th is looking more and more likely. Especially considering Google+ posts from Google employees trollishly talking about "Licorice" have reached a fever pitch, and HTC Communications Manager Jeff Gordon is tweeting about having just received something secret. I wonder what it could be, Jeff. The final launch of Android L is due for this fall, and it would make perfect sense for the Nexus 9 to accompany it. Not to mention that the Nexus 7 has been out of stock on the Play Store for months now. We're definitely due for a new Nexus tablet, and if the rumors are right it looks like the Nexus 9 could land with a serious splash. And considering that Google has established something of a habit of announcing its new Nexus devices in a flurry of press releases with no accompanying event, you can expect it any day now.